The main purpose of this writing contest is for you to come up with ideas on how to promote cultural understanding and social harmony. You are encouraged to write an essay on how to improve the race/ethnic relations in our society. You may use a personal experience/observation, current event, history, literature or other to support your idea. 1. You must be a high school or middle/junior high school student in Suffolk County (private or public school). 2. The essay must be in English, word processed or typed, double spaced and in Times New Roman and 12 point font. The length of the paper should be between 3 to 5 pages. All entries will become the property of Asian-American Advisory Board and will not be returned. 4. Entrant’s name should be shown on the last page of the essay. 1. 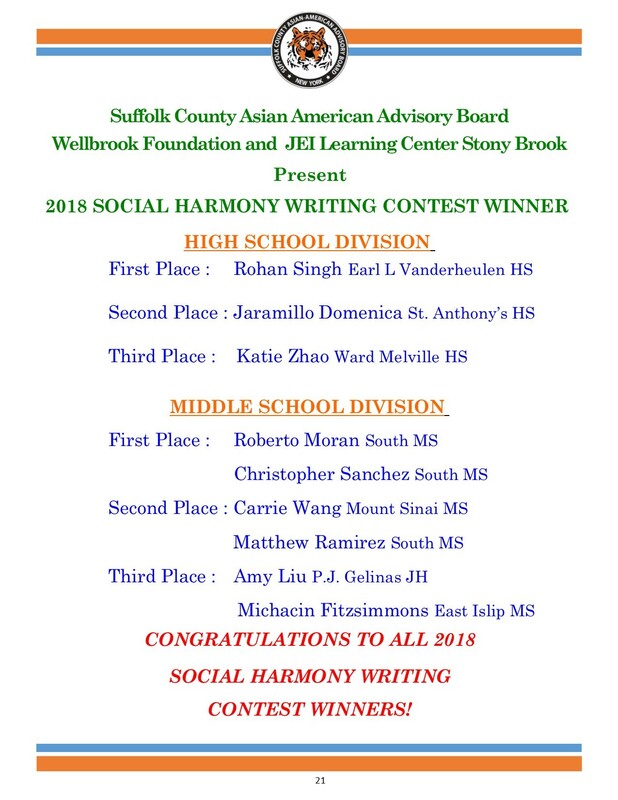 A certificate of accomplishment will be awarded by the Suffolk County Executive and Asian-American Advisory Board. 3. All winners and their families will be invited to an award ceremony scheduled to take place during the Asian-Pacific American Heritage Month Celebration on May 25, 2019 at the Thai Cultural center Centereach, NY.